Hi, there! Tap on a question below to go to the answer. Can I talk to the seller first before buying a job? I saw the term “ready to order” in my request. What does that mean? What kind of requests are not allowed? What happens after I buy a job? Should I give my contact info to the sellers? Can I ask for a seller’s contact details? How do I send files to the seller? Can I speak in Filipino to sellers? Who are the job sellers in the site? How do I buy a job? How do I buy Store Credits? Does my payment go directly to the seller? Can I deposit credits to my account? Do I pay any fees on top of the price shown on the site? What should be my next step after receiving the output? How do I Mark as Complete a finished order once the seller has done the job? How to can I cancel an order? The seller missed the deadline / isn’t responding to my messages. Can I pay sellers after the job is done? Any tips on how I can get the best person for the job I need? What if someone offers to take the payment transaction outside 199Jobs? What happens if I didn’t like the output of the seller? The seller is accusing me of something, how do I get help? Can I get a cash refund for cancelled orders? I paid without creating an account. What’s my account name? My messages disappeared in my Inbox. Help! Can I receive alerts using a second email address? Who can we talk to for questions? Please read our complete Terms of Service here. 199Jobs is an online marketplace where you can buy digital services quickly, easily and affordably. You can hire any of our job sellers to do services such as article writing, virtual assistance, graphic design, social media marketing, technical support and more. We are mainly a community of online Filipino workers. All jobs start at 199 Philippine Pesos (that’s around USD 5). We did this so that you already have an exact and affordable price that works within your budget even before you hire someone for the job. Of course, there are job sellers that offer add-on services to the basic P199 job. These are bundled services like quicker delivery, extra services, and/or multiple orders. The exact prices for the add-on services are shown along with the job, making it easy for you to readily incorporate all your costs within your outsourcing budget. Does the low price mean low quality of work as well? The job sellers in the marketplace are individuals who are skilled at the job they’re offering. This means most of them won’t even have to break a sweat in rendering the service because they’re very proficient at it. For example, a graphic artist can easily come up with a basic design in less than an hour; just like an adept writer can finish an article within minutes. For them, getting paid P199 in exchange for the time they’ll spend on the job is actually worth it. You can do so by Posting a Request and letting the buyers pitch their services to you. This way, you can discuss details with sellers beforehand while assuring them that you are a serious buyer. The easiest way is to just go to our Post a Request page. You can also go to My Account > Requests, or click Post a Request in the footer of any page. For writing jobs: specific topic/s to write about, word count needed, style to follow, restrictions (no plagiarism, due date, etc). For design jobs: type of graphic you need, inspiration the artist can draw from, size of the design, restrictions (colors to use, fonts to use, etc). For admin and other jobs: description of the task, quality of the output, deadlines, etc. When a request has “ready to order”, it means that you have Store Credits equal to or greater than your budget for the request. It’s a signal to the sellers that you are ready to pay for good work. We also highlight this request so that they see you are serious in getting this request done. To fund your request, simply buy Store Credits for your account. Tap here to learn more. We’ll send an email to the seller immediately after you pay for the job. When you buy a job, pay close attention to the “Instructions to the buyer” that will appear as the first message in the conversation thread between you and the seller. This will tell you the things you need to provide him or her to complete the job that you requested. Or more detailed instructions on how the job process will proceed. Moreover, while we understand that you might want to use email or SMS for your conversations, we highly recommend you course all messages via the order’s chat conversation so we can resolve conflicts and problems if there’s any. Nope. Please send all messages via the 199Jobs messaging system for your safety and security. Send a message to the seller using the conversation for that order, attaching any and all files the buyer needs (see below). You can also upload the files using Send.FireFox.com, Transfer.sh or File.io, then send the link to the seller. Syempre! Yes it’s okay to talk in Filipino or Tagalog! Minsan kasi di naman magaling sa English yung seller (lalo na kung di siya writer) so mas maganda na rin yung wikang Pinoy. Who are the job sellers on the site? They’re a very diverse mix of part-time and full-time Filipino online workers who decided they want to make money from doing things they’re good at. Some are corporate employees, others are self-employed individuals, while some are entrepreneurs. There are also job sellers that offer services on things that they simply enjoy doing and getting paid is just an icing on the top for them. First, register by either using your email address or via Facebook Connect. If you’re already registered, then just sign in to your 199Jobs account. Then, look for job sellers who are offering the service you need. You can use our search text box to easily filter the job listings, or browse through them by choosing any of the job categories on the side. When you find the job that you’re interested in, click on it to load the job page. The seller will often provide more details about the service, including sample works, and reasons why he or she is the right person for your job. You can click the name of the sellers if you want to read their profile on the site to see their qualifications and skill sets. If you’re satisfied with what you see, click the “Order Now” button and pay for the job through any of our payment options. After that, wait for the job seller to contact you and you can now talk about your service requirements. After the seller sends and delivers the job, mark it as complete in your dashboard and you’re done! We accept payments through PayPal, credit card, including GCASH Mastercards, PayMaya Visa Cards, Coins.ph Virtual Cards. We also accept BPI Express Mobile payments and bank deposits through BDO and BPI, but you have to convert them into Store Credits first. Click on your preferred payment method to see the instructions how to pay for that method. Please note that the price you see on the job is what you will pay. There are no extra fees when paying. Use the Store Credits to purchase jobs, jobs with addons, or multiple jobs! You can use your credit card by going through PayPal. PayPal is our card payments processor. You’ll then be redirected to PayPal. 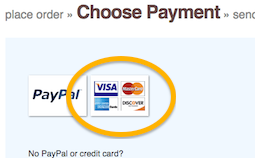 You should be automatically redirected to the credit card payment form. If not, click “Pay with Debit or Credit Card” as shown below. From here, just fill up the form and follow PayPal’s instructions! You also have the option to create a PayPal account. 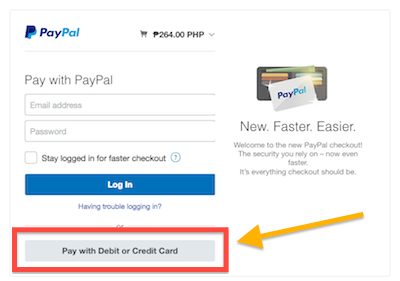 We recommend that you do so since this way, PayPal will securely store your credit card details for easier future payments. Not immediately. When you buy a job, the payment is held by us until successful delivery of the work for the job. Once the job is successfully completed and accepted by you, then that’s the only time the seller gets the payment. This is done for your protection. The seller will never see your payment details like your PayPal email or bank details. Also, if the seller fails to deliver the job, then the payment can be easily refunded back to you. If this happens, we can likewise help you find another seller that can do the job. Can I add Store Credits to my account? Yes! You can buy Store Credit here. You’ll automatically get the credits so you can buy more easily. Some of our frequent buyers do this so that it’s easier and faster to buy from multiple sellers and to buy multiple times from the same seller. In addition, you get to control how much you spend since 1 Store Credit = 1 PHP. Store Credits expire after one year, so use them well! Note: If you are paying via bank deposit or bank transfer, please send the payment within 48 hours from placing an order. Nope, what you see is what you pay for. There are no additional charges for buyers when purchasing from the site. A Custom Order lets you quickly turn your Request into an order, helping sellers work on your tasks faster. No more waiting for the seller to edit their add-ons! 1. Post a Request with a budget of at least P1,000. 2. Respond to the sellers who offer their services to you and agree on the final price for the work. 3. Click on the link to create a Custom Order. 4. Pay for the order and you’re done! Please note that this feature is only available with selected experienced sellers. If you’re already okay with the work, please tell the seller that their work is accepted. Next, ask them to Mark as Delivered the order. After they do that, please choose Mark as Completed to transfer payment to the seller. If you’re currently reading the messages of the seller in the order chat, scroll up to the menu options for that chat. Click on the Mark as Completed option under the order. Make sure to click Yes to confirm in the message that shows up. Another way is to go to My Account, then Orders. Then click on the Mark as Completed option under the order. Make sure to click Yes to confirm in the message that shows up. How to can I cancel an order? The seller missed the deadline or isn’t responding to my messages. Please note that we discourage cancelling orders if the reason is outside the seller’s control. This includes cancelling because the output was rejected by a third-party (a buyer’s client, for example), subjective reasons, and personal reasons. On the other hand, many sellers are willing to revise their work. Please ask the seller how many and what kind of revisions are included in your order. Please go to the order chat. At the top of the message thread are options on what you can do next. Click Cancel Order at the right side to cancel the order. After you cancel, you will get Store Credits back to your account equal to the amount you paid. If you don’t see that option, kindly ask the seller to cancel the order for you. Unfortunately, this is not allowed. You will need to place an order before the seller does any of the work. This ensures that they get paid. Don’t worry, we won’t transfer the funds until you are okay with their work. Look at the seller’s sample work, or ask for it if it’s not given in the job listing. You also can click the profile name of the seller to see some uploaded work. But if there’s nothing there, then just send a message and ask him or her to add some samples so you can see the style and the quality of the seller’s output. Message a seller before buying and check the response time. Faster response means you’ll have an easier working relationship since that seller will likely be online most of the time and you can get things done more quickly. Sellers who ask a lot of questions might be annoying but it shows that they care about their work. They want to get every detail right so I always stick to sellers with this attitude. Ask the seller how he or she will do the work. The most experienced ones already know their process and will gladly share it with you so you don’t get any surprises later on. If you’re planning to outsource long-term work, use the first job as a test of the relationship if you and the seller will work well with each other. If not, then you can always find someone else until you find a good fit. Contact us if you need any kind of help. We are glad to assist you in any way, which includes looking for sellers that can fulfill your requirements. You should tell them that you prefer using 199Jobs, because this way, you can benefit from the trust and security of our system. Why should I go through 199Jobs instead of just talking directly to the seller? Payment security. You get assurance that work will be delivered. Less headaches too, since we handle the transactions for you. No more money talk, just wait for your job to get done and that’s that. Secure info. You won’t have to share personal info like IDs, email addresses, Paypal and bank accounts. Help sellers that produce the best output. We have mechanisms in place that help sellers show how well they work. An example is the feedback system. By using this, you are able to help trustworthy sellers gain more authority and earn more. It’s good karma! The best thing to do is to ask the seller to revise or fix it, especially if it’s just a minor change. This is up to the seller to accept the new request, but most of the time, they’ll agree to it especially if you can point out anything they missed out doing from your original request. This is where the importance of using our messaging system really comes in. It gives you a historical log of all your conversation with the seller. Remember that if something is wrong, don’t hesitate to tell the seller. Filipinos usually hate direct confrontation but in this case, it’s needed since you’re talking with each other online. It helps sellers improve and gets things resolved much more quickly. Say your piece politely but frankly and in a Filipino way (in Filipino, if needed). Lastly, if you’re having a hard time resolving an issue, contact us and we’ll mediate the process for both you and the seller. If you’ve tried calmly discussing it with the seller and that didn’t work, reach out to us and maybe we can help out. Take note that we might be obliged to pass along the dispute to the authorities if warranted. Can I get a cash refund for canceled orders? Sorry, but as per our Terms of Service, we do not offer cash but we do offer Store Credits in return. These Store Credits can still be used to buy other jobs in the future. Your account was automatically generated from your PayPal email. Please check that email’s inbox to get your username and password. Kindly wait for the email if you haven’t received it yet. Or you can reset your password here using the same email as above to get a new password. There was a problem processing your Inbox. The quick fix is to click Show More Messages. This will reset the Inbox so you can see the rest of your messages. Yes! Just go to My Account > Profile and add the additional email. After verifying that you own it, you’ll receive alerts through that email as well.